I’m really grateful that my children’s primary schools are very sporty and they’ve had the opportunity to try so many different activities whilst they’re so young. They seem to be developing a love for exercise and that makes me happy as I know the benefits it will bring them in every aspect of their lives. There was a major furore in 2014 when Michael Gove the then Education Secretary suggested that exercise be used as punishment in UK schools. In my opinion laps of the field for bad behaviour is not the way to improve the health of our increasingly obese children. My son actually said he’d see it as a treat! Thankfully, largely due to an online petition, support from sporting stars such as Paula Radcliffe and Chrissie Wellington and the sporting community as a whole this issue was brought to everyone’s attention. The subsequent Education Secretary Nicky Morgan had this section of the guidance removed when she took over from Mr Gove. As a runner herself she clearly understood why sport should be used as a positive force and not a punitive measure. Nurturing a love of exercise is crucial in producing healthy happy children. Whilst some of the responsibility sits with schools I feel the bulk of it lies at home. If as parents we can make exercise fun and part of our usual routine then our children will think it’s normal, enjoy it and have good habits for life. It’s often easier said than done and it does require energy, enthusiasm and imagination to keep the spark alive. There are different challenges at different ages; from actually managing to get out of the door when they’re tiny to coping with their changing body image as teenagers. I suggest trying as wide a variety of activities as you can. We all know how different our children are in their temperament and interests. There are so many sports to try. Team games teach leadership skills and help to build confidence but individual sports suit some children better. My oldest quieter child has discovered a love of climbing, my bubbly daughter craves dance in any form and my youngest son thrives on competitive cross-country running. They’re very different personalities and finding the sports that catch their interest has taken time. Sport doesn’t have to be expensive, some of the best activities are free. If you haven’t tried parkrun then I urge you to do so. 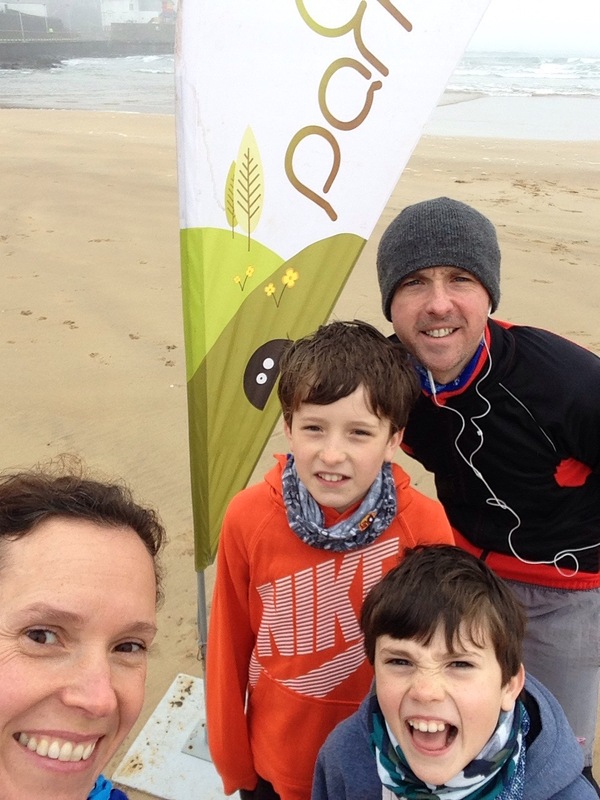 We loved our first experience doing park run. 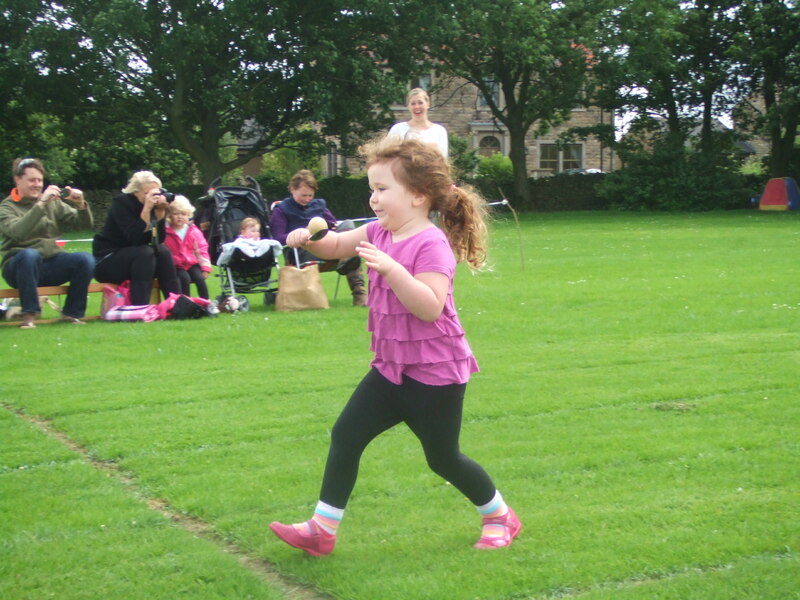 Junior parkrun is now well established and more courses are popping up all over the country on weekend mornings. It’s for all abilities and it’s free, it’s a sociable fun way to exercise. One of the best ways to get kids active is to be a great role model yourself. Children love to imitate their parents from a young age but even as they get older the way you live your life has a massive impact on how they choose to live theirs. This places a great deal of responsibility at our door but as parents we’re used to this. We should embrace it and look on it as something enjoyable and positive that will benefit the whole family rather than seeing it as a chore. It’s a wonderful gift to be able to give them. 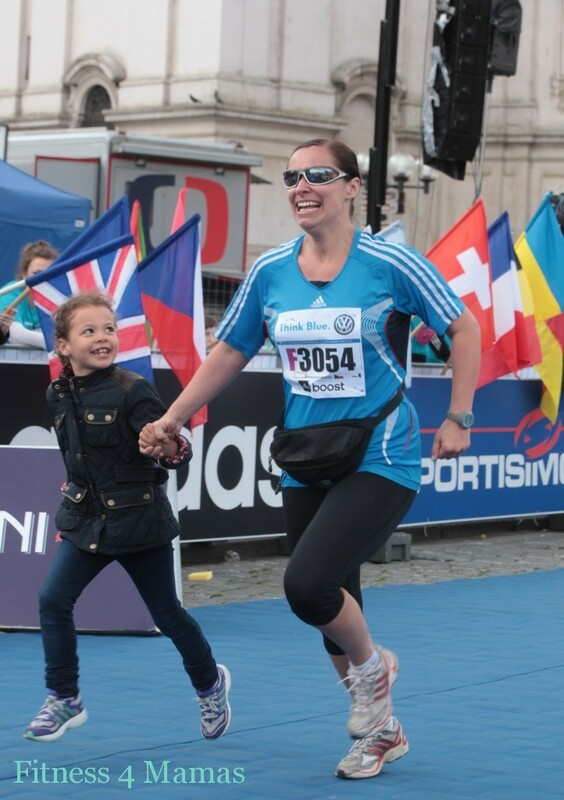 Just look at the admiration and pride in the face of this little girl as she joins her mum running the last stretch of the Prague marathon. I feel it’s a powerful image. This is Mirka Moore of Fitness4Mamas. Have a look at her blog for great fitness tips and motivation. I sometimes feel bad that although my children do just as much sport as me their kit is not of the same quality as mine. I find it hard to get really good technical wear in such small sizes. My son just ran a long cross country race in a 100% cotton Tshirt, his choice but I’d never wear that; I’d choose a fabric that wicks sweat away from the body. I know young children don’t sweat as much as adults but they shouldn’t settle for second best. Occasionally I’ll come across a good breathable base layer but I can never find the range or variety that’s available for adults. I’m always searching through the bargain buckets but am rarely successful. As most of my followers will know I’m a huge fan of Nuu-Muu dresses. They’re my first choice of clothing particularly for my marathons as they’re so comfy, stylish and perform at the highest level. I wrote a blog about them as people are always asking me where I get them. They do have a girls range and Nuu-Muu kindly sent me one for my daughter. She’s so interested in fashion and spends ages deciding what outfit to run round the village in! 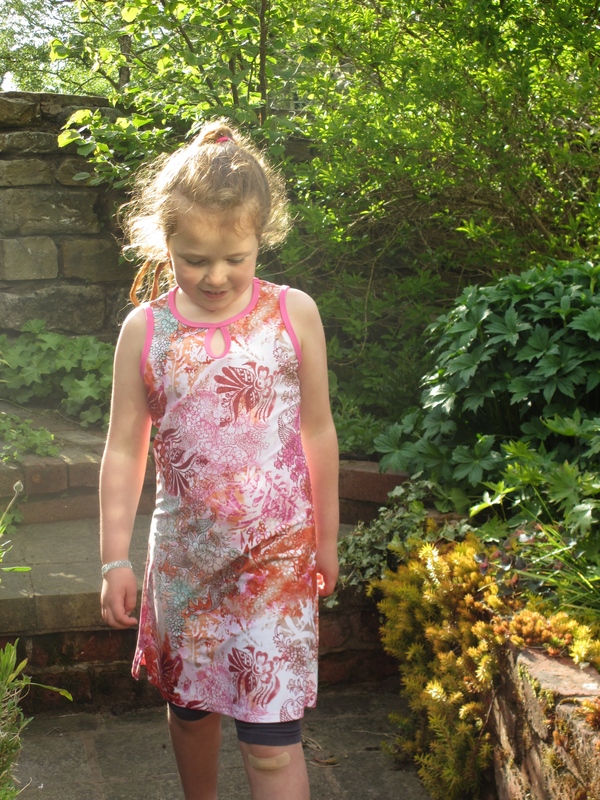 The Mini-Muus come in sizes from age 3 to 10 and the design and fabric is of the same high spec as the adult dresses. Perfect for your active girls. Molly chose to wear shorts under hers as she spends most of her time upside down doing cartwheels at the moment! So, be imaginative, be enthusiastic and try new things. Get active yourself, join friends and family and set a great example. Achieve health through exercise and above all HAVE FUN! As a special treat Nuu-Muu have given me a girl’s Mini-Muu to give away. You can choose the style and the size! Visit the on-line Nuu-Muu store to browse. If you’d like the chance to win one then you can enter via the Rafflecopter below. Just choose as many of the options as you like. Good luck! A brilliant post and so true. I know I am not the best role model when it comes to being active but I always encourage mine to be active. My 11 year old does lots of sport and my husband often worries that he does too much but I disagree, if he wasn’t always out doing sport, he would be permanently attached to a screen, so the more the better. Yes, my eldest seems to have 2 modes; sport or screen too. As long as there’s lots of sport then I figure is bit of screen is much needed relaxation for him. Thanks so much for reading and commenting. This is very interesting 🙂 I think the major thing that put me off any kind of sport when I was younger, was the emphasis on competitiveness. I was never much of an athletic performer, so I constantly felt like I was letting myself or my team down by losing! Even gymnastics, dance and horse-riding were made into a ‘competition’. My reaction was to reject exercise in all its forms rather than seek to find something I could just enjoy. I now enjoy aerobics and pilates as well as brisk walks and swimming. I really wish I had been able to experience non-competitive sport as a child, but I just didn’t know such a thing existed! It’s a good Point Ellie. It’s important to find what’s right for each individual. At the same time I do think some competition can be a healthy thing and see some schools/groups shying away from it entirely. It’s how it’s managed that is the crucial thing and it certainly isn’t easy. Sadly, there’s a dearth of primary school teachers with a PE specialism. Schools look for appropriately qualified/ experienced/ enthusiastic teachers to be curriculum heads in the various academic areas but ‘dump’ PE on the teacher who’s most recently done a charity fun run or hasn’t already got responsibility of any other area. The other sad factor is that a lot of primary school teachers set a very bad example in terms of their own health and fitness. I can’t back this up with any data, but from observation, i’d say that there are a lot of overweight and/or unfit teachers. That’s not good for their own health and well-being and I’m sure it doesn’t help inspire children. I’m really aware how lucky my children are to have skilled PE teachers at primary level. It’s a tragedy this isn’t a nationwide experience. It’s such an important age to ignite that spark. As for overweight teachers setting a bad example, I don’t think Drs and other health care staff are any better! So much work to be done. Thanks for commenting Tim, these are really important points. It is really important for parents to take the lead and take some ownership over the fitness and health of their children. Having said that it is hard, especially when they are preschool age and the form of exercising with them can be very repetitive, tedious or one sided. It can be difficult to think of fun exercise to do together where you both want to do it! So far I can do about 10 minutes of singing the bear hunt song whilst trudging round the house, a gymnastics class where firstborn does the gymnastics and I sweat with a baby in a carrier on my front flinging him onto various pieces of equipment and we do scooter riding (well he does) round the block. Can’t wait till he gets a bit older and we can take up cycling on the downs together or swim together. Then I can try to slim down my mum-tum and he can find something to get into. Those dresses are great – wonder of they will look ok on a boy…! Oh my, I remember those days! Guess I wrote this with primary and secondary kids in mind. The pre-schoolers however do like to imitate us so it’s never too early. I applaud you managing a whole 10mins of the bear hunt, I have a particular dislike for that song and was rather fed up when my now 7yr old wanted a rendition ‘for old times sake’ on a recent walk. Amazing how quickly you can get over/under/through when they’re 7. Sadly the bear ate us so we won’t be singing it again 😉 Hang in there it gets easier and lighter without a little person attached to your front. Thanks Emma, sorry the competition is now closed. I’ll have to run another one! I agree, we need a new generation that lives to move. Previous PostI chatted to … Shona Thomson; marathon runner and adventurer.